TV is not better than movies, so stop saying so. It’s not, and that’s a lazy argument. 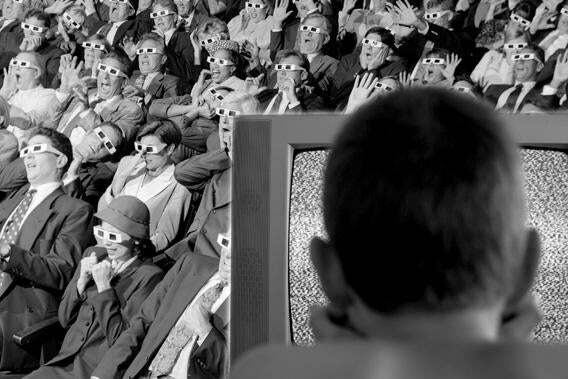 Movies vs. TV is not a new debate. Photo illustration by Lisa Larson-Walker; original photos by Thinkstock. Who was the first person to say that TV is better than the movies? It’s probably impossible to say, but the argument in its contemporary form may date to October 1995, when Bruce Fretts—with “additional reporting” from 10 (!) of his colleagues at Entertainment Weekly—offered, over several pages, “10 simple reasons why the small screen is superior” to the big one. Even if you didn’t read it at the time, the piece will feel strikingly familiar: Replace NYPD Blue and The X-Files with Mad Men and Breaking Bad and the argument made by Fretts is more or less identical in its essentials to the one that over the last six or seven years has appeared in Time, Newsweek, the New York Times, the Wall Street Journal, Vulture, Vanity Fair, Entertainment Weekly (again! ), and on blogs too numerous to count. But that bit of early-EW populist rabble-rousing was pre-Sopranos, when the Emmys were still dominated by the networks. The big awards players at the time were NYPD Blue, ER, and Picket Fences. (Pretty good shows, but come on.) Meanwhile, the movies that year brought us Toy Story, Before Sunrise, Heat, Clueless, Safe, 12 Monkeys, The Usual Suspects, To Die For, Dead Man, Kicking and Screaming, Casino, Seven, Welcome to the Dollhouse—not to mention the five movies nominated for Best Picture, a whole bunch of good films made overseas, and some excellent documentaries. Recently, one writer argued that 1995 was the “best year ever for movies.” Unlike this year, when the Emmy nominations remind us of the high quality of recent television shows, it was flatly ridiculous to argue for TV’s superiority in 1995. It would seem, then, that a subset of cultural critics has wanted to make the TV-is-better argument for a long time, well before it was even remotely plausible—and for reasons having little to do with the artistic merits of the best TV shows and the best movies. But why? On some level, of course, the whole argument is absurd. People will tell you that the dozens of hours TV shows devote to their characters make those characters richer than their cinematic counterparts—but dramatists have known for literally centuries that you only need one night to create a character people will never forget. TV boosters note again and again that, on cable, the writer is king—something I certainly appreciate as a writer. But why is it better for writers, rather than directors, to have final say in what is ultimately a visual medium? And besides, no critic watches enough television and movies to compare the two media with any thoroughness. (One wonders how many of the movies from ’95 listed above that Bruce Fretts, the EW writer, had seen. He keeps bringing up Showgirls.) What’s more, it is becoming harder and harder to keep up: There are so many cable networks and so many movies getting made every year—and the old “it never played here” excuse no longer works for the littler movies, thanks to video-on-demand and DVDs and so on. That this is what’s really going on was brought home for me while reading Brett Martin’s very enjoyable new book, Difficult Men: Behind the Scenes of a Creative Revolution, all about TV’s post-Sopranos golden age. In the prologue, Martin writes that the prestige cable drama is “the signature American art form of the first decade of the 21st century, the equivalent of what the films of Scorsese, Altman, Coppola, and others had been to the 1970s or the novels of Updike, Roth, and Mailer had been to the 1960s.” Put aside, for a second, the overwhelming maleness of that list (though it’s not entirely incidental). Put aside, too, the fact that Norman Mailer wrote his best novels before the 1960s had begun and Roth wrote his well after that decade was over. Focus instead on this idea that there is, at any one point, a single “signature American art form.” That’s a ridiculous notion. And Martin goes a step further later on in the book: “Men alternately setting loose and struggling to cage their wildest natures has always been the great American story,” he declares, “the one you find in whatever happens to be the ascendant medium at the time.” The great American story? You mean there’s only one? Critics who claim that TV is better than the movies now would generally, it seems, prefer that there only be one. And when it comes to quality, TV remains, for the most part, a great simplifier. Ask nearly any professional critic—not to mention many amateur ones—for the best TV shows of the last decade or so, and you will get a very familiar list, starting with The Sopranos and ending, probably, with Breaking Bad, or maybe, say, Homeland or The Americans. You will almost certainly have heard of every show. You are not likely to encounter the sometimes bewildering variety that a collection of film critics is likely to present you with. Take today’s Emmy nominations, which, though there were, as always, a few surprises and snubs, generally rewarded the prestige dramas—House of Cards, American Horror Story, Game of Thrones, Mad Men, Breaking Bad, Homeland—that most people regard as the best stuff on TV. Compare that to any year’s Oscar nominations, which encompass multiple filmmaking styles and span the studio and indie world and still rarely scratch the surface of what critics and serious moviegoers consider the best of the year. Or just consider the wild range of movies on view in a critics’ poll of the best 2013 movies so far, from Before Midnight to Upstream Color to Spring Breakers (and that’s just the top three—and we’re still months away from Oscar season). It may be true that, for much of the year, you can’t find good movies just by driving to the multiplex, while there’s often something good waiting on your DVR. And that people aren’t talking enough about the really good films that get released—sometimes on only a handful of screens—throughout the calendar year. But the proper solution to this problem, if you’re a critic, is not to tell people to just watch TV instead. It’s to tell us which new movies are worth our attention, and where they can be found. It’s to make the conversation about the art that matters the most. In fact, plenty of recent movies have inspired a great deal of cultural conversation. (Zero Dark Thirty, Django Unchained, and Lincoln come quickly to mind.) But more importantly, when it comes to the real artistic merit of what we’re watching, the volume of such conversations is neither here nor there. You know what people talk about even more than Breaking Bad? Sports. I can discuss football, baseball, and basketball with huge numbers of people from all walks of life. But that doesn’t make the last Red Sox–Yankees tilt a work of art (especially not lately). What bothers me most about the TV-is-better line, finally, is that TV could be better. As this year’s many Emmy nominations for Netflix series helps to demonstrate, we now watch a lot of “television” and “movies” in the same way: at home, on big TV screens and little computers. Behind the Candelabra, which got 15 Emmy nominations, is an HBO presentation in the States—and a movie overseas, where it is playing on the big screen. The gap between these two media is closing—and there’s no reason, theoretically speaking, that the adventurous approaches to visual storytelling that we see in certain movies couldn’t come to TV, too. We could all start watching more foreign-language shows—I hear Borgen is great—and more independently produced Web series, which get better all the time. We could, in other words, eventually have a television landscape that is as artistically rich and varied as the movies are right now. And that would be a true golden age.